Claydon Drills has successfully defended and upheld a challenge to the patent on its unique twin-tine seeding system (European Patent No. EP1608214B1) following proceedings at the European Patent Office in The Netherlands. The unsuccessful action was brought by Amazone-Werke. Filed on 24th November 2003, the Claydon Patent relates to ‘a new method and apparatus for sowing seed directly into uncultivated land, including minimally-cultivated seedbeds or, without modification, for conventional drilling’. The focus of the Patent is the use of a leading tine for digging and forming a shallow trench of loosened soil, followed, in-line, by a second tine fitted with lateral wings which is used to plant the seed in the trenches formed by the leading tine. The soil is only disturbed in spaced, linear regions determined by lateral spacing of the tines, and the strips of soil in-between remain intact. The simple yet highly effective two-tine, patented design therefore creates the ideal growing environment for each seed, with drainage and space for roots to grow, allowing high yields to be achieved from the outset. Developed and patented by Suffolk farmer Jeff Claydon, the Claydon Direct Strip Till Seeding System has become renowned throughout the world. 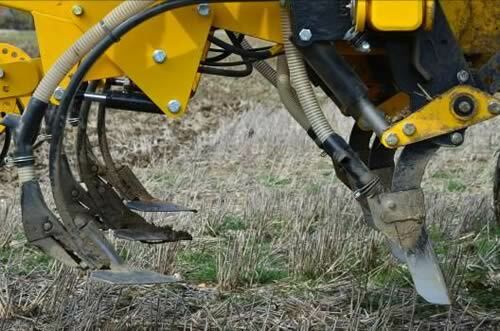 Proven in 24 countries, in all climates and soil types, the patented Claydon System allows growers to establish a wide range of crops directly into stubble, min-tilled or fully-cultivated soils, approximately five times faster and at one-third the cost of a plough-based system, with significant yield and environmental benefits. The key to the drill’s success is the patented, highly effective two-tine system which encourages very deep, complex rooting structures to develop quickly, minimises soil erosion and ultimately leads to stronger, healthier crops with improved yield potential. “I am delighted that the European Patent Office has upheld the validity of my patent, which clearly demonstrates that the Claydon system is both innovative and original,” Jeff Claydon stated following the decision.